This page is an introduction to Pandora Sellars (1936-2017). the botanical masters of the past and one of the top botanical painters of all time. “One of the most important botanical artists of all time” and “the best leaf painter ever” is how Pandora Sellars is described by the leading independent botanical art collector in the world. She is universally recognised as one of the most important and influential botanical artists working in the 20th and 21st Centuries. Pandora (known to friends and family as Paddy) began painting orchids after finding camera film was unable to record the colours of her husband’s orchids accurately. She had trained as an artist but lacked any formal training in botanical illustration. Hence she developed her botanical art from first principles - based on her design training and her excellent eye for colour. She understood very well how to plan, place and arrange the elements of art in her work. As a result the design and composition of her paintings excel. They demonstrate clarity and dramatic impact as well as botanical accuracy derived from careful observation and very fine painting. 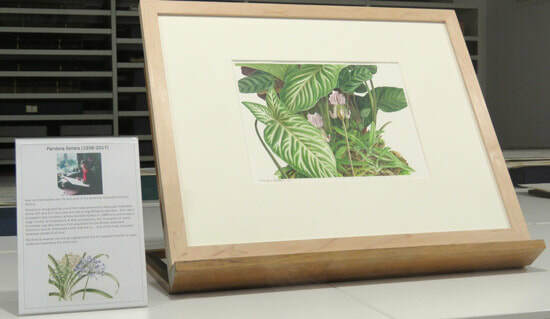 In the 1970s, she began to exhibit at the RHS in the 1970s and soon learned what was required of an excellent botanical painting prior to achieving a Gold Medal in 1977. 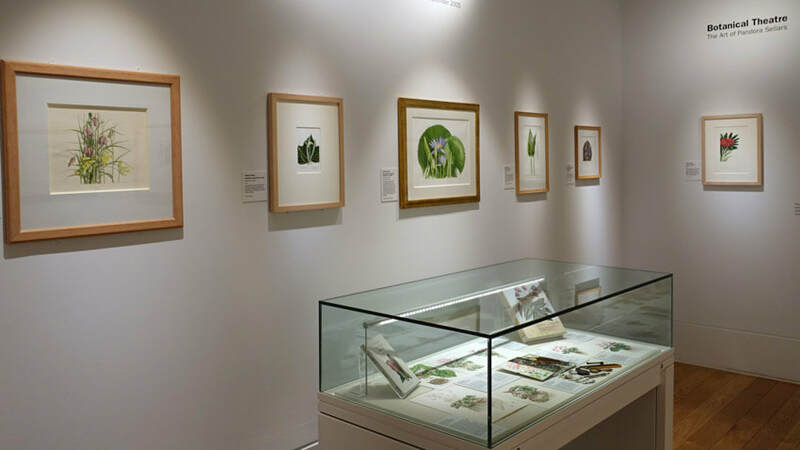 ​Her RHS exhibits captured the attention of the botanists at Kew who needed high quality illustrations for their scientific publications. Margaret Stones, the principal illustrator at Kew, taught her about what was required of a botanical illustration for publication and encouraged her to produce work for Kew and Curtis's Botanical Magazine. 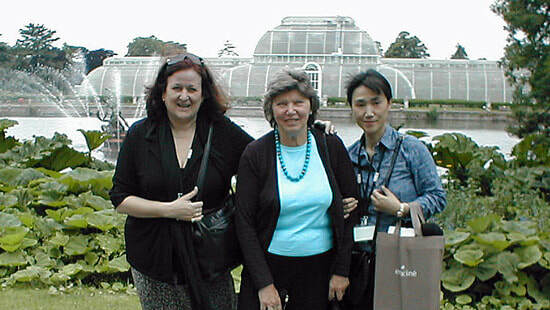 ​Pandora subsequently had a very long and productive relationship with the Royal Botanic Gardens at Kew. Pandora Sellars also helped stimulate a renaissance in botanical painting when one of her more theatrical works was purchased by Shirley Sherwood at her sell-out exhibition at the Kew Gardens Gallery in 1990. This, in turn, stimulated more purchases and commissions and the start of a great botanical art collection. Her paintings became more widely shared in exhibitions and books and have been a significant influence on subsequent generations of botanical artists - especially after close inspection! In later life she focused less on painting and more on teaching students of botanical art from the UK, North America and Japan. 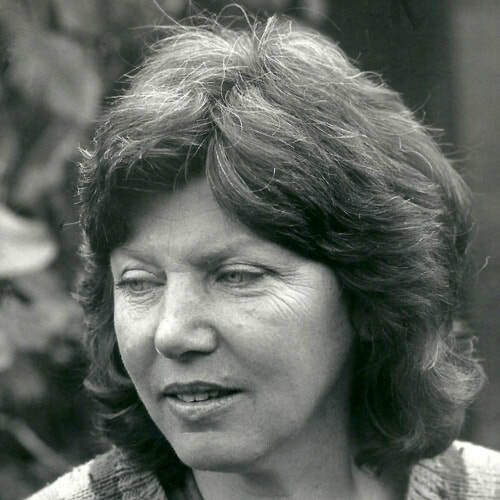 1936 - Pandora St. Christopher Brace was born on 25 August 1936 in Hereford and was brought up in a hamlet in a very rural area of Herefordshire between the Wye Valley and the Black Mountains. She grew up loving nature, collected and pressed the wild flowers she found and started drawing and painting plants as a child. 1957 - Age 21, she married James (Jim) Sellars (1927-2000), a respected artist, printmaker and art lecturer. Their first married home was in Ulverston in Cumbria and both worked in Barrow-in-Furness. Shortly afterwards, they moved south to Southampton after Jim secured an appointment as Head of Fine Art printmaking at the Southampton College of Art. 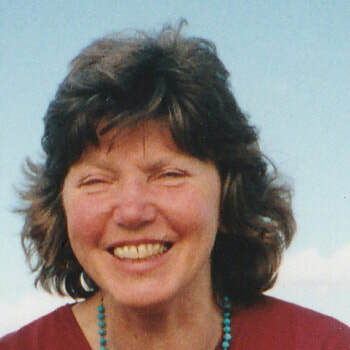 Paddy became a mother (of daughter Sarah) and worked part-time as an art teacher. Her husband built heated greenhouses for his hobby of growing aroids, orchids and tropical plants. When Pandora found it was impossible to record their colours and form exactly using photography, she began painting the plants using watercolours. ...and so her career in botanical illustration started. produced commissioned work for horticulturalists, botanists and botanical art lovers. She contributed numerous botanical paintings that now form a treasured part of Kew’s permanent collection. 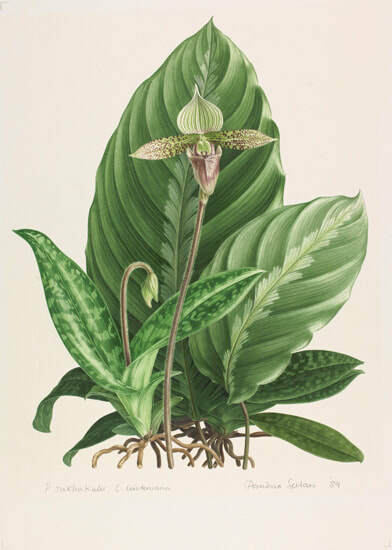 P. sukhakulii, C. lindeniana [Paphiopedilum and Cypripedium] (Watercolour on paper, 1989) © Estate of Pandora Sellars. Courtesy of RHS Library Collections. 1984 - Her paintings were published in a book. 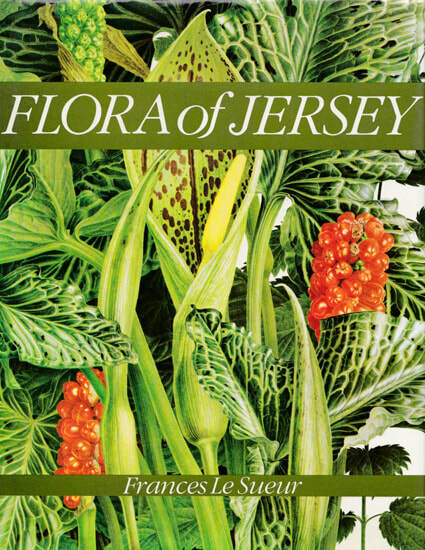 18 specially commissioned watercolour paintings by Pandora were included in ‘Flora of Jersey’ by Frances Le Sueur (published 1984). These include both classic specimen illustrations and her complex compositions portraying companion plants in their natural habitat. ​Painting for publication suited her. She was a modest woman who neither sought the limelight nor any associations with art galleries. She painted for publication at 1.5 times life size and her scrupulous attention to botanical accuracy, tone and detail generated exquisite results. ‘Genus Cyclamen’ (Brian Mathew, 2012). 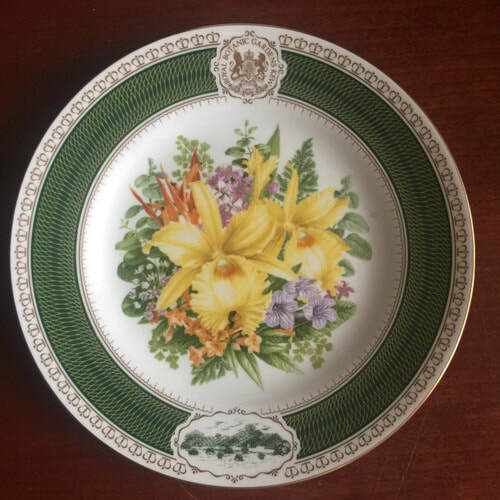 A commemorative plate by Spode with a design based on her painting was also commissioned. 1990 - Pandora Sellars botanical painting 1974 – 1990 Pandora had a very successful solo exhibition (a sell-out) at the Kew Gardens Gallery. Her theatrical watercolour Laelia tenebrosa (1989) caught the eye of Dr Shirley Sherwood. It challenged conventions for how plants should be painted at the time and helped trigger Dr Sherwood's interest in the scope for botanical painting her subsequent support for botanical artists which contributed to a significant renaissance in botanical art. 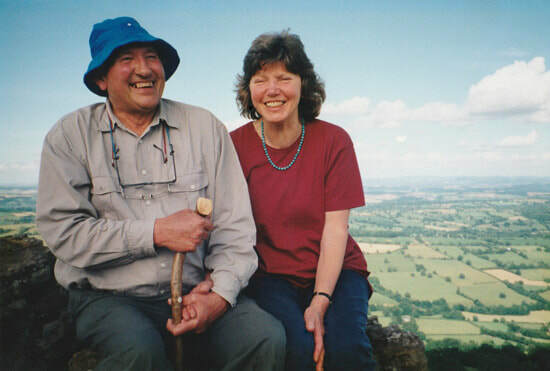 1992 - Jim and Pandora moved back to Herefordshire after her husband’s retirement. Painting took a back seat while new greenhouses were built and the garden established. 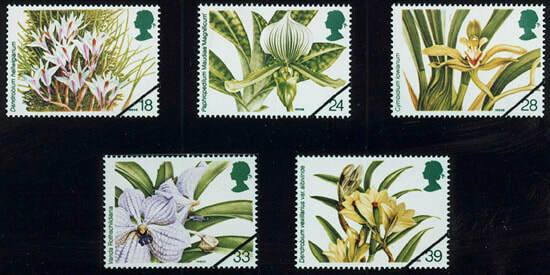 1993 - Her paintings of orchids are released as a set of Royal Mail stamps to mark the 14th World Orchid Conference at the Scottish Exhibition and Conference Centre in Glasgow in April 1993. 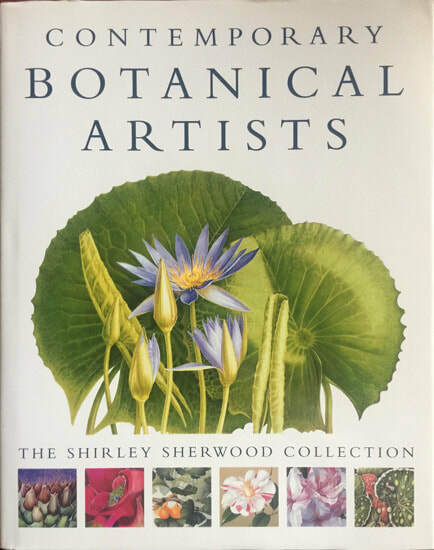 1996 - Her Blue Water Lily (1995) provided an eye-catching cover for Dr. Sherwood’s book about “Contemporary Botanical Artists” (1996). Many of today’s leading botanical artists date their interest in botanical art back to this book and her paintings. Who can forget the blue waterlily on the cover? One shouldn't underestimate the impact this had in the mid 1990s when the book began to appear on the shelves of bookstores around the world. Blue Water Lily by Pandora Sellars - the feature image of the cover of the first book about Contemporary Botanical Art by a leading botanical art collector. 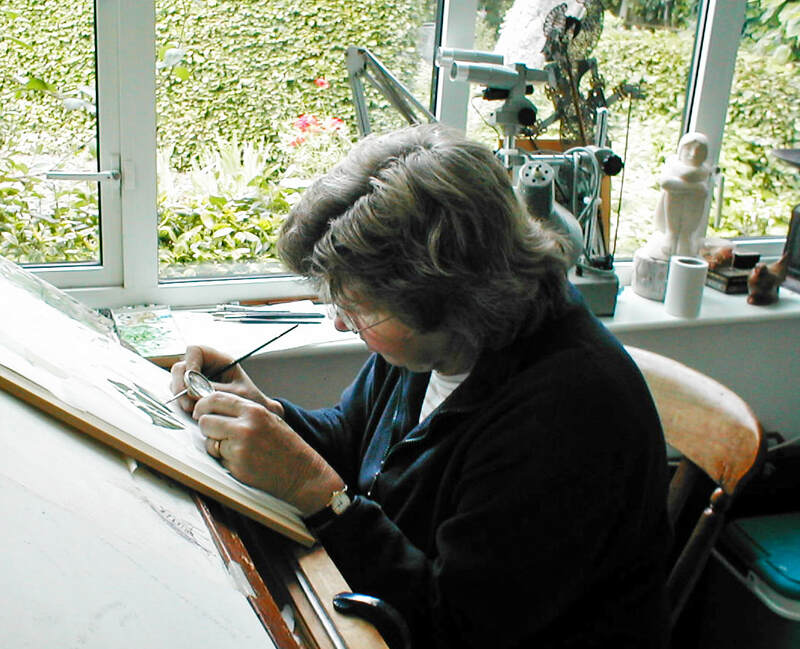 1999 - The Linnean Society awarded her ‘The Jill Smythies Award’ for excellence in botanical illustration. 2000 - Jim Sellars died. Paddy then converted his last orchid greenhouse into a space for teaching botanical illustration to the artists from the UK, North America and Japan who wanted her to teach them. Her students now win RHS Gold Medals and have exhibitions of their work at the gallery in Kew Gardens. 2017 - Pandora Sellars died on 9th May 2017, age 80. ​An exhibition which featured five of her paintings had opened at Kew some six weeks earlier in March 2017. Her daughter Sarah, son-in-law and her much-loved grandson Thomas survive her. 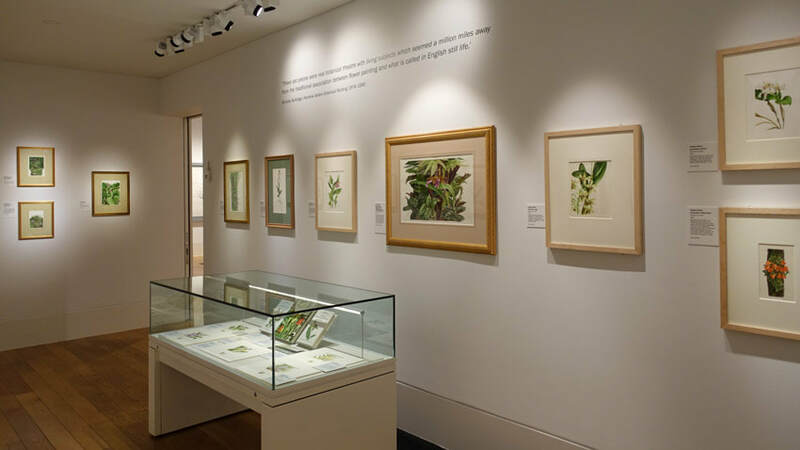 A retrospective exhibition of he paintings at the Shirley Sherwood Gallery of Botanical Art at Kew Gardens was visited by botanical artists from all over the UK and the world. 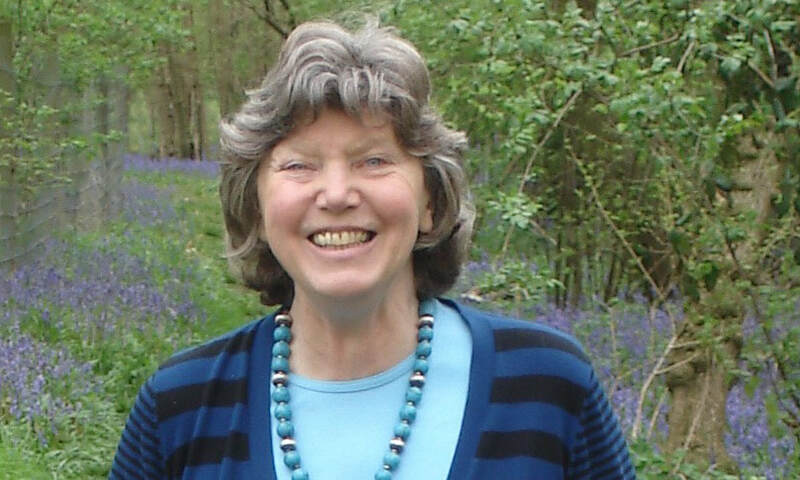 All who knew her personally held her in the very highest esteem, for her kindness and generosity as well as her exceptional talent and dedication to botanical art as an artist, teacher, mentor, colleague and friend. The tributes to Pandora on her death bear witness to the very high regard people had for the woman, the artist, the art teacher and her art - and are listed at the end of this page. See MORE TRIBUTES section below. Pandora painted plants in watercolour. She preferred to paint on high quality hot press acid free watercolour paper. She soaked her paper before stretching it on a drawing board and then sealing the edges with brown gummed paper. She used very small (hotel breakfast marmalade) jars to mix up enough watercolour paint for a specific colour in a painting. Her particular talent was for being able to paint multiple plants in well thought out compositions. In fact, most artists when asked will highlight "composition" as being one of the stand-out qualities of her botanical artwork. It's what makes her work transcend a wholly accurate rendition of a plant. She also paints the most amazing leaves and, to my mind, knew exactly how to paint proper saturated colour and at the same time suggest how light falls on structures to suggest form. Her work positively jumps off the page! Studying how she uses leaves in compositions to reinforce her focal points is an exercise which will pay dividends. Pandora Sellars changed the lay of the land for all those botanical artists who followed her, opening up possibilities for interpretation not previously imagined. We admire the subtlety and sensitivity with which she rendered each petal and leaf, but also the drama, complexity, and freshness of the compositions she created, whether for a Bot Mag plate or in one of her massive tapestry-like stagings. From conception to execution, she took no short-cuts, and her work still leaves me awe-struck. No matter how many times I’ve seen one of her paintings, there is always something new to see. I feel very privileged to have had Pandora to stay with me as I invited her to run some workshops here at Heligan for my students. We were in awe at her meticulous attention to detail, and at the time she took in preparing her compositions. We watched how she painted around every fine hair on a stem. We still call it "doing a Pandora"! She was inspirational to those of us who aspire to excelling in Botanical Painting, and in my eyes is still the one of the best artists in our field of all time. She also opened our eyes to the importance of composition. She introduced us to new ways of describing our subject, highlighting contrasting leaf shapes , colours and forms, put together to form a vivid and memorable image. ​I still have the Brussels Sprouts with the leaf placed behind that we did with her. I shall treasure it! ​Pandora was able to produce the elusive 'wow' factor in her work, aesthetically pleasing as well as scientifically accurate. I value the few days she was with us here in Cornwall very much indeed, and she will be sadly missed. 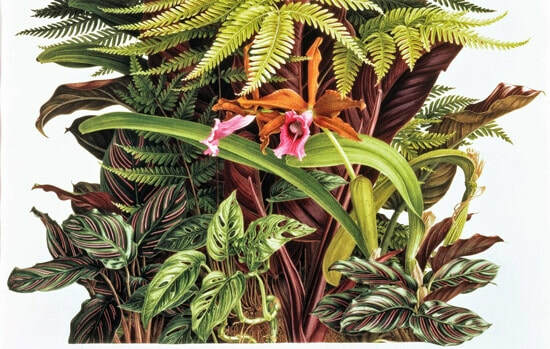 1990 - Pandora Sellars botanical painting 1974 – 1990 - Kew Gardens Gallery. Kew had opened its gallery in 1988 and immediately began discussions with Pandora about an exhibition at Kew. They had to wait a little while because of her claims on her time due to her schedule of booked commissions. Looking over the twenty or so works painted specially for this exhibition one is immediately aware of being in the presence of a consistent and superior talent in the delineation of plants: the fidelity to nature is absolute; the quality of draughtsmanship unwavering; the use of colour impeccable and the representation of texture without equal. Just as many of us first respond musically to large-scale works such as symphonies, so it is the large-scale ‘plant symphonies’ which instantly attract and are most accessible. Chamber works often appeal later as knowledge and appreciation matures. Similarly one moves from admiration for the large complex paintings to a deep respect for the elegant but simple plant portraits which have formed the main body of her work for over ten years. Her paintings are an education for all who see them and are treasured by all those who own them. I aim to develop an inventory of paintings by Pandora Sellars. This will take sometime and for the most part will always be incomplete until every last one has been tracked down! This is a wonderfully composed work, showing her early training asa designer. Each green-golf slipper orchid trails a pair of twisted brown petals and the painting is executed with unnerving perfection down to the finest hairs on the stem which are hardly visible except under a magnifying glass. 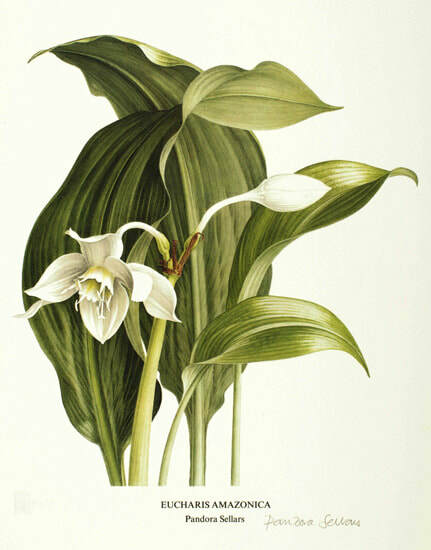 18 colour Plates published in Flora of Jersey - in this series she focused on one of the classical reasons for botanical painting, the recording of plants associated with and found in a very specific geographical area and published in a scientific book about the flora of that area - in this case the Island of Jersey in the Channel Islands. The following are plates in The Genus Paphiopedilum by Phillip Cribb - published as a Kew Magazine Monograph in 1987. Of the 56 colour plates in the book, Pandora contributed nearly half - 26 plates in total. 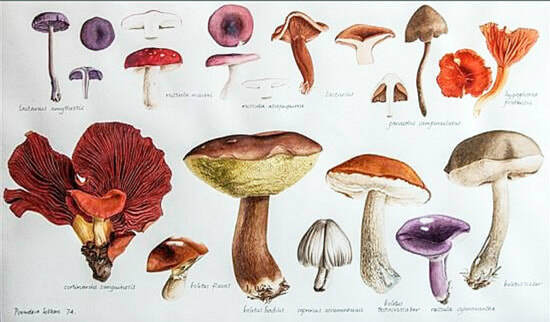 ​At least some of the plates were originally published in the Kew Magazine at an earlier date. News of Pandora's death triggered a number of obituary articles and appreciations of her work. Plus a LOT of memories and tributes by botanical artists who knew her or had met her or had been taught by her - or had just seen her paintings and been inspired by them. and Australia owe much to the paintings of “the best leaf painter ever”. Many are also very appreciative of the tuition she gave in later years, which always laid an emphasis on the importance of composition as well as accuracy. Paddy, although I can no longer tell aspiring botanical artists that you are the greatest living botanical artist of our time, you will always be one of the most legendary. Your rich legacy lives on in your remarkable paintings. I am truly honoured to have known you for all those memorable years and I treasure the wonderful times spent with you. I first met her at the RHS, in 1978 when we were both first showing our work. Everyone who saw her amazing compositions was completely bowled over by the tremendously high standard which she achieved, together with her unique painterly approach. She has been an inspirational role model, both to me and my students ever since, and she and her exemplary work will be sadly missed. A remarkable and meticulous Botanical Artist who will remain an inspiration to all of us who aspire to becoming successful in our field of study. I was deeply saddened to hear that Pandora had died. I was privileged to have had her to stay in my home to run workshops from my studio for my students. We were in awe of her meticulous attention to detail and the perfect precision in her studies. Pandora demonstrated how she painted around every single minute hair on a stem when it was placed in front of another part of the plant. To this day we call it " doing a Pandora ". She also opened our eyes to the importance of composition. I still have the Brussels Sprouts with the leaf placed behind that we did with her. I shall treasure it! Although I sadly never met her, I am the proud owner of one of her watercolours, which I treasure. Some years ago she had an exhibition at Kew. By the time I got there seemingly everything had been snapped up. I happened to look behind a door. My lucky day. A perfectly beautiful little painting of hazelnuts, and no red spot. It hangs in my bedroom, and gives me so much pleasure. A wonderful artist. 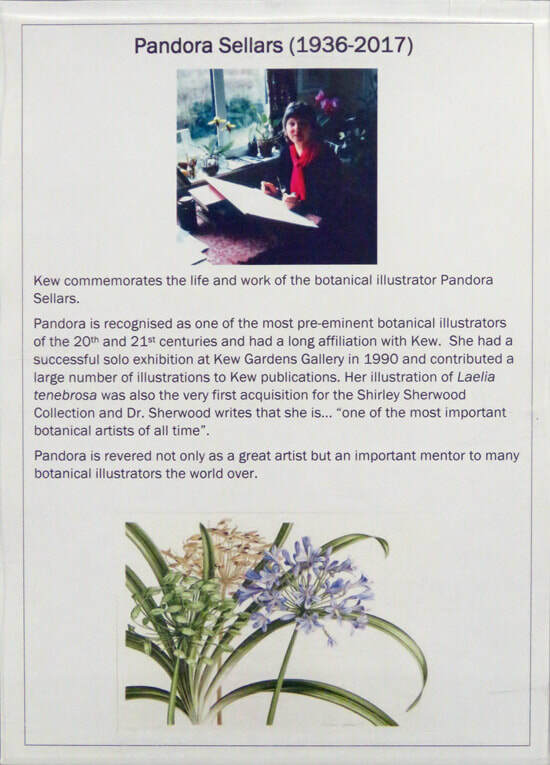 "Well over a decade ago whilst a diploma student in botanical art at the English Gardening School, I received a couple of days tuition from Pandora Sellars. I recall her piercing blue eyes as she put me through my paces with composition exercises. Truly a ‘light bulb’ moment, which inspired me to put composition at the heart of every drawing and painting I create. Her meticulous draftsmanship shone out of the simple class notes she provided,. Just a couple of hand drawn and annotated photocopies, but with instructional drawings of unique precision and beauty. I have them still and treasure them. Thank you Pandora, you will be greatly missed"
I first met Pandora when she came to teach us at the English Gardening School in 1996. As a group we had been to see the Shirley Sherwood Exhibition at Kew and were totally in awe of Pandora and her incredible work. In the flesh she was charming and funny with many stories to tell. She possessed the most amazing blue eyes - just like forget-me-nots. I took a workshop with Pandora Sellars at an ASBA meeting back in 2008 in California. I was a bit in awe of her and very curious to see how she worked. She had misplaced her glasses so I loaned her my reading glasses. I remember looking over at her paintbox and being absolutely astonished -it was filthy! Dust, fluff, and I’m sure I saw cat hairs! Yet she cheerfully produced gorgeous sketches from it with a ratty old brush, borrowed glasses, in a sketchbook that looked like blotting paper from where I stood. When I catch myself fretting about materials, getting too precious about them, or getting bent out of shape over changes in paper or paint, I remind myself of that afternoon and remember how little it all has to do with how a great artist really makes art happen. (2) how to cram a study of a large subject onto an A5 window - the effect is to exaggerate size , by making it limited..... oh how clever she was! ​The third was when she shared her need of little jam jars ... you know those little ones you get at the breakfast table in a hotel? She needed them for her paint.... to mix enough of one colour when she was doing her Cyclamen studies for her "Genus Cyclamen" publication. I think I gave her five or more. I feel almost blessed to have short sight, and share her passion for detail. 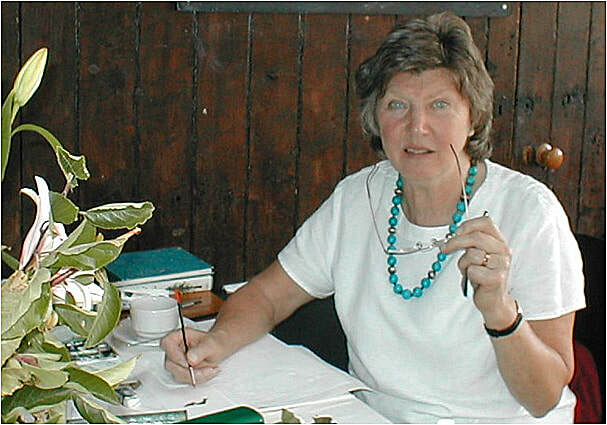 She was a truly inspirational artist, one who made the world of contemporary botanical art, what it is today. Thank you Pandora. The great thing about Pandora's work was that she elevated the art of botanical illustration to such a great height that it superseded any categorization. Quite simply she was the best, and she was also completely original. In the mid 1980's she had a short article written about her for Vogue magazine by the illustrator/painter Lawrence Mynott. Vogue magazine was not the usual showcase for botanical illustration, but it dedicated a page to her superiority. I recall that her work was at the time generally considered to be far in advance of Rory McEwen's because it was painted from observation, in contrast to McEwen's photographic hyper realism. Consequently, Pandora had huge respect from fine artists of all disciplines. She was never flashy or glamour ridden, but exceedingly self effacing and 100 percent committed to her cause. No one has ever bettered her work, which was entirely in service to plants. Photographs of her were rare, and she remained always classically beautiful with eyes like stars and dark hair. I consider it to be very remiss that she was never officially graced with the OBE. The level of service that she gave to plant life and to teaching, quite apart from her paintings and book illustrations, would surely have warranted this award many times over. I was heavily influenced by Pandora work back in 2010 when I hung some of her work in one in the exhibitions at Kew, The Waterlilies and Arums. I remember being really impressed by her brush technique as well as her incredibly modern approach to composition. For me it was on par with Rory McEwen. It was probably Pandora's influence that got me to start chopping things off along straight edges. She's in my top ten most influential artists. Like many artists of my age, Pandora Sellars was one of the very few truly inspirational Botanical artists. Masterful composition, colour and technique, but with that extra something, the undefinable quality, which can't be taught and sets her apart as one of the greats. 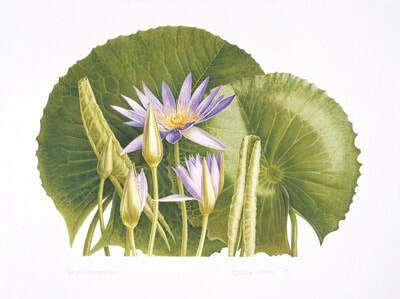 For me she was the complete package of what a botanical artist should be - rolled into one! A great loss, she was truly original and a visionary, apart from being technically brilliant. Many years ago when I set out to try a career in fashion, I immediately began to dream of a life less stressful, that would offer me the chance to get back to drawing and painting, Pandora's work gave me that solution. I found the inspirational work of Pandora Sellers by chance; I discovered a fig growing wild in a piece of waste land near where I lived in London and painted it with such enthusiasm that my boyfriend (now husband) bought me a book by Shirley Sherwood to celebrate my new found painting passion. In this book I saw Pandora's art and fell head over heels in love with the precision and artistry. Pandora was the queen of composition even her signature displayed her creativity; I fell in love with her work and it set me on a path to seek my own style of botanical painting. I shall be forever grateful. Dear Pandora rest in peace, you were an inspiration to so many. Books typically included her illustrations and those of other people too. 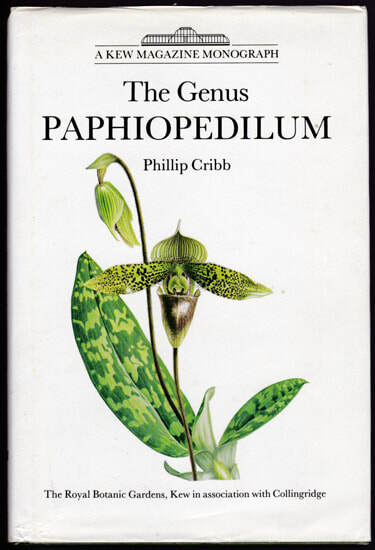 The Genus Paphiopedilum By Cribb, Phillip The Royal Botanic Gardens, Kew/Timber Press, 1987. Hardcover. 222 p. 24 cm. 56 colour plates of orchids, 71 sets of b&w line drawings and 15 maps. Green cloth hardcover in pictorial dustjacket. The Genus Cyclamen: In Science, Cultivation, Art and Culture (2012) by Brian Mathew, plant taxonomist and former editor of Curtis’s Magazine.